Bremerhaven ( [ˌbʁeːmɐˈhaːfn̩], literally "Bremen's harbour", Low German: Bremerhoben) is a city at the seaport of the Free Hanseatic City of Bremen, a state of the Federal Republic of Germany. The Emperor Ferdinand III ordered his vassal Christina of Sweden, then Duchess regnant of Bremen-Verden, to restitute Bremerlehe to Bremen. However, Swedish Bremen-Verden soon enacted the First Bremian War (March to July 1654) and in the following peace treaty (First Stade Recess; November 1654) Bremen had to cede Bremerlehe and its surroundings to Swedish Bremen-Verden. The latter developed plans to found a fortified town on the site, and much later this location became the present-day city of Bremerhaven. In 1672, under the reign of Charles XI of Sweden, in personal union Duke of Bremen-Verden—colonists tried unsuccessfully to erect a castle (named Carlsburg after Charles XI) there; this fortified structure was meant to protect, as well as control shipping heading for Bremen. As possibly the most critical North Sea base of the Nazi War Navy, the Kriegsmarine, most of the city was destroyed in the allied air bombing of Bremen in World War II; however, key parts of the port were deliberately spared by the Allied forces to provide a usable harbour for supplying the Allies after the war. All of Wesermünde, including those parts which did not previously belong to Bremerhaven, was a postwar enclave run by the United States within the British zone of northern Germany. Most of the US military units and their personnel were assigned to the city's Carl Schurz Kaserne. One of the longest US units based at the Kaserne was a US military radio and TV station, an "Amerikanischer Soldatensender", AFN Bremerhaven, which broadcast for 48 years. 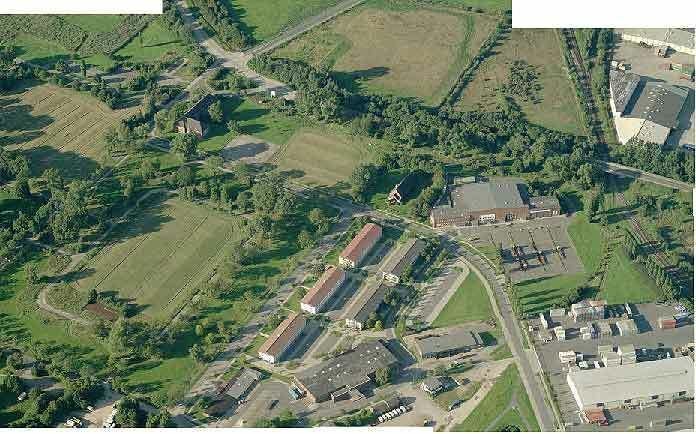 In 1993, the Kaserne was vacated by the US military and returned to the German government. In 1947 the city became part of the federal state Free Hanseatic City of Bremen and was consequently renamed from Wesermünde to Bremerhaven. 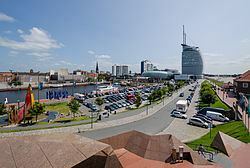 Today, Bremerhaven is therefore part of the city-state of Bremen, being to all intents and purposes a state comprising two cities, while also a city in its own right. This is complicated somewhat by the fact that the city of Bremen has owned the "overseas port" within Bremerhaven since 1927. To further complicate matters, a treaty between the two cities (as mentioned in Section 8 of Bremerhaven's municipal constitution) makes Bremerhaven responsible for the municipal administration of those parts owned directly by Bremen (known as stadtbremisch). The port of Bremerhaven is the sixteenth-largest container port in the world and the fourth-largest in Europe with 4.9 million twenty-foot equivalent units (TEU) of cargo handled in 2007 and 5,5 million in 2015. The container terminal is situated on the bank of the river Weser opening to the north-sea. In the wet dock parts, accessible by two large locks, more than 2 million cars are imported or exported every year with 2,3 million in 2014. Bremerhaven imports and exports more cars than any other city in Europe. Another million tons of "High-and-Heavy" goods are handled with ro-ro ships. In 2011 a new panamax-sized lock has replaced the 1897 Kaiserschleuse, then the largest lock worldwide. Bremerhaven has only a few historical buildings, and the high street and city centre are almost entirely post-war. The main attractions for tourists are found at the Havenwelten and include the German Emigration Center (since August 8, 2005) and the German Maritime Museum (Deutsches Schiffahrtsmuseum) from 1975, featuring the Hansekogge, a vintage cog dating from 1380, excavated in Bremen in 1962, and the historical harbour (Museumshafen) with a number of museum ships, such as the Type XXI U-boat Wilhelm Bauer (a museum of its own), the Seute Deern (a wooden three-masted sailing vessel), and the salvage tug Seefalke from 1924. The Bremerhaven Zoo reopened on 27 March 2004, after a lengthy renovation. It features Arctic wildlife, both terrestrial and marine. The latest addition is the Klimahaus from 2009, simulating travel adventure along the 8th line of longitude and dealing with climate issues. Two gazebos can be found on top of the Atlantic Hotel Sail City and the Radar Tower. Another tourist spot is the Fischereihafen (fishing port) in Geestemünde which also houses an aquarium (the Atlanticum). The Lloyd-Werft shipyard is renowned for building and renovating large cruise liners, for example Norway. The Fischtown Pinguins, also known as REV Bremerhaven, is a professional ice hockey team in the DEL, Germany's top Ice Hockey league. The Eisbären Bremerhaven (Polarbears), founded 2001, is a basketball team playing in the 1st division of the Basketball Bundesliga. Jenny Dolfen (born 1975) German illustrator and teacher.